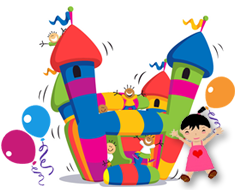 An even more adventurous option is our inflatable obstacle course rental that vary in size depending on your needs. The obstacle course rental is the perfect way to add a unique twist to a bounce party. They are also great for bringing fun to corporate, school, and camp events. Our inflatables are commercial grade and made in the USA. That is why they are great for adults and children alike. Details: This huge obstacle course rental includes racing, cross over lanes, climbing, obstacles, crawling, dual slides and much more. 65 foot Challenge is great for any event including corporate, school, birthday party, reunions…you name it. Features: The 45 obstacle course rental includes racing, cross over lanes, climbing, obstacles, crawling, and dual slides. This obstacle course has something for every one, younger kids, older kids and adults. Details: The 40 foot obstacle course rental contains racing, cross over lanes, climbing, obstacles, and crawling. The Obstacle Course rental is a great interactive game that will move lots of people. The obstacle course could be used to race or to see how many times you can go through it. Details: The 85 foot obstacle course rental contains racing, cross over lanes, climbing, obstacles, and crawling. Details: The 65 foot obstacle course rental contains racing, climbing, obstacles, and crawling.